Ever wondered what happens when you put your orange sack outside your front door? Well, if you're happy to hold your nose for an hour or so, you are invited to visit the new £25m waste and recycling facility that Lambeth uses, run by the Western Riverside Waste Authority. 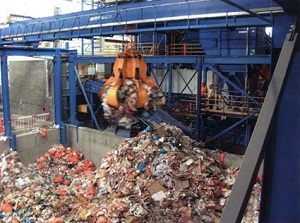 Visits have been arranged by Lambeth Council as part of Recycle Week 2011, and give residents a first hand view of how the machines help materials to be processed faster, more efficiently and more cost effectively than before, it is claimed. The facility, which is in Wandsworth, and was opened earlier this year by the Princess Royal, uses the latest technology to separate a variety of materials, such as plastic, metal cans, paper, cardboard and glass collected from homes across Lambeth. It means that materials collected in Lambeth no longer have to be taken to another facility in Kent, as before, meaning fewer lorries on the road, and less pollution and congestion, according to the council. To take part in the visit, email Catherine Bourke, waste development officer on cbourke2@lambeth.gov.uk or call 020 7926 8971 for more information.